The first-round draft choice is trying to get up to speed after missing five practices, but Vikings fans already can't wait to see the new breakaway threat. 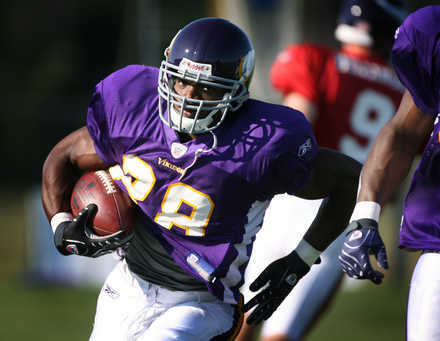 MANKATO - The contrast of Adrian Peterson's first day on the job was hard to miss. Off the field, the rookie running back already seemed to have achieved superstar status among a Vikings fan base desperate to identify a player deserving of their adoration. As the newly minted millionaire walked to the locker room after Monday's second practice, fans lined up four deep along two fences -- many wearing Peterson's No. 28 jersey -- and implored him to sign autographs. He did so for 23 minutes. But what Peterson's fan base might have missed was that he remained on the field long after most of his teammates in order to work on blocking fundamentals with running backs coach Eric Bieniemy. The reality is that the seventh overall pick in the NFL draft still has plenty to learn, and prove, before he can expect the adoration of his teammates and coaches. Peterson, though, seems to lack no confidence in his ability to win everyone over. "I'm the type of person, I set my bar high," said Peterson, who missed the first five practices of camp while his contract was being negotiated. "I am not right now just going to throw out any numbers, but I can sit here and tell you I would like to get rookie of the year and MVP. That is just how I set my bar. Some people might say it is crazy, but I give myself a challenge every year." Peterson's challenges Monday were of a far simpler variety. Going on little sleep and having received a crash course in the Vikings offense from Bieniemy, Peterson appeared to be simply trying to keep up and get the small things down. This resulted in some rookie mistakes. In a two-play sequence during afternoon practice, he failed to pick up a safety blitz and then was part of a botched handoff exchange with rookie quarterback Tyler Thigpen. The quarterbacks and running backs had worked on their exchanges early in the morning session. Peterson went into the drill having failed to fasten his chin strap. "Buckle up, 28," Bieniemy said. "Buckle up." 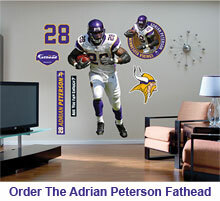 If that was an indication Peterson was about to be subjected to some heavy hitting, it didn't happen. Peterson and his left collarbone, which he fractured last October while playing for Oklahoma and re-injured in the 2007 Fiesta Bowl against Boise State, absorbed little to no contact Monday. In fact, during an 11-on-11 hitting period late in the morning session, Peterson received no reps. The Vikings have acknowledged their desire to protect Peterson's collarbone by having a small device sewn into the left shoulder area of the shirts he wears beneath his jersey. But coach Brad Childress attempted to dismiss the notion that the team doesn't want Peterson getting hit in practice. "He was right in the middle of that inside drill, that 9-on-7, and aside from bringing it all the way to the ground [by being tackled], is as live as we get," said Childress, adding that he expects Peterson to have some contact today. Peterson said there are "no issues" when asked if he has been cleared for hitting. "The collarbone, to have that behind me and over done with, it just feels good," he said. Peterson, who signed a five-year deal Sunday that includes $17 million guaranteed, was equally as happy to be in uniform. "I felt like they wanted me to get to camp as fast as I wanted to be here," he said. "So I kind of had an idea that [the holdout] wouldn't be too long." During his absence, Peterson had been studying his playbook at home in Norman, Okla., and calling teammates "to ask them what they have installed." On Monday, Peterson took the first step in showing those teammates what he might be able to add to a Vikings offense that struggled in 2006. "He's an explosive player, he's a spark," center Matt Birk said. "I think we're all just anxious, players as well as fans, to see what he can do in the pads. He's a hard-working guy, he's got the right attitude and will definitely help this football team."